The Pioneer was not part of the original Amtrak system, which replaced the nation’s private passenger railroads on May 1, 1971. In the late 1960s, proposals to eliminate one of the two trains on the Union Pacific’s Pacific Northwest mainline through southern Idaho met strong regional resistance, but when Amtrak was formed, all of the Union Pacific passenger service in the Pacific Northwest was abruptly discontinued. The absence of Amtrak service running east from Portland in eastern Oregon and southern Idaho motivated state and federal officials to push for a train to bridge that gap. Their efforts reached fruition on June 7, 1977, when the Pioneer was born as a Salt Lake City-Seattle train. At that time, Amtrak’s San Francisco Zephyr train ran from Chicago across southern Wyoming on the Union Pacific mainline to Ogden, Utah, from which it continued on to California. It crossed the Pioneer’s path in Ogden, giving the new train a connection with Chicago and the East. On October 28, 1979, another train, the Desert Wind, began operating between Los Angeles and Ogden; between Ogden and Chicago it operated as a section of the San Francisco Zephyr. The Denver and Rio Grande Western Railroad meanwhile continued to run its Rio Grande Zephyr, a remnant of America’s once-proud fleet of private trains, on the route from Denver through the spectacular canyon of the upper Colorado River, to Utah and Salt Lake. Things would soon change. In the spring of 1983, the Rio Grande Zephyr ceased operations and the San Francisco Zephyr – renamed the California Zephyr – shifted south, taking over service on the Rio Grande Zephyr’s route between Denver and Salt Lake. From there it turned north to Ogden, then west towards California. The Desert Wind’s northern terminus simultaneously moved to Salt Lake. That city’s Rio Grande Station thus became the junction point for all three trains, which exchanged through-cars there as a coordinated service. On October 27, 1985, the California Zephyr stopped calling at Ogden, heading west directly from Salt Lake instead, and eliminating the overlap between its route and thePioneer’s between the two Utah cities. That situation prevailed until June, 1991, when Amtrak shifted the Pioneer’s routing in order to restore service to Wyoming. Now the train ran as a section of the California Zephyr only between Chicago and Denver. 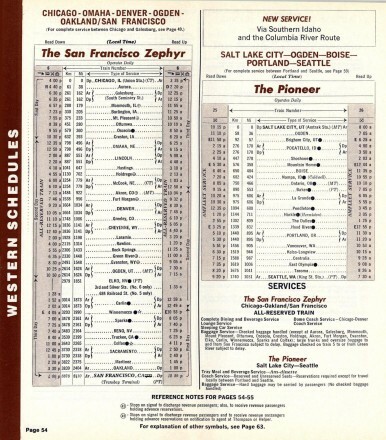 There, the westbound train split off from the Zephyr as its own train and proceeded north to Wyoming, then west to Ogden, then along its established route north and west to Portland and Seattle. The Desert Wind continued to ply the Salt Lake-Los Angeles route. As part of an attempt to reduce costs, Amtrak reduced service on all three routes in the autumn of 1993, reducing the Pioneer to a thrice-weekly service at all points west of Denver. Amtrak supposed that travellers would simply concentrate their travel on the days when the Pioneer still ran, but such was not to be the case: in eastern Oregon towns, the reduction of service by 4/7, or 57%, led to a 58% drop in ridership compared with the late 1980s. Efforts were made to continue funding for the train, but the long-threatened end came on May 10, 1997, when the last Pioneer pulled out of Seattle for the return to Chicago. The Desert Wind disappeared along with its sister train to the north, and today Amtrak’s service through the heart of the West consists of but one train, the California Zephyr. In the late 1990s, the Association of Oregon Rail and Transit Advocates spearheaded a drive to restore the Pioneer as a train that would carry mail and express – expedited freight – as well as passengers, since Amtrak at that time was incorporating express into many of its other trains. At the same time, Ron Wyden, Democratic senator from Oregon, and Mike Crapo, Republican senator from Idaho, launched a bipartisan effort to initiate a train on part of the Pioneer route, between Portland and Boise. As late as 2004, Amtrak’s strategic plan made a passing reference to the Portland-Boise route as being “under discussion,” but, given the Bush Administration’s skepticism towards Amtrak, the mention meant little. To many onlookers, the Pioneer was history.